In China, the Contract Law of People's Republic of China (the PRC Contract Law) is the most important legislation dealing with commercial contracts and commercial disputes. The PRC Contract Law was promulgated by the China's National People's Congress on 15 March 1999 and came into effect on 1 October 1999. The judicial interpretations issued by the highest judicial authority, namely, the Supreme People's Court (SPC) are also binding rules for deciding commercial contract disputes. Although China is not a case law jurisdiction, Chinese judges are more and more inclined to refer to decided cases, especially those decided by the SPC or higher level courts. The SPC also encourages this trend by publishing selected decided cases quarterly. Chinese courts, especially those located in major cities such as Beijing, Shanghai and Shenzhen, are very experienced and have a good record in deciding commercial contract disputes. In China, parties are generally allowed to agree on the court jurisdiction or refer the dispute relating to the contract to arbitration. In the absence of such agreement, a party is allowed to file its claim to the court where the defendant has domicile or where the contract is performed. In order to successfully file its claim with the court, the injured party, in other words the plaintiff, needs to submit civil complaint and preliminary evidence to the court. If the court agrees to accept the case, the plaintiff will be required to pay a court acceptance fee that is calculated based on the claiming amount. Under Chinese law, a contract can be formed by mutual agreement by parties. To reach a legal binding contract, parties must have appropriate capacity for civil rights and capacity for civil acts. All individuals have capacity of civil rights. Individuals' capacity for civil acts are determined by their age and mental status. Capacity of civil rights and capacity of civil acts of commercial entities registered in China are provided in their business licences issued by the Chinese authority. Foreign entities' capacity shall be determined by the law of jurisdiction where they are registered. A contract can be made in writing, orally or by other means unless written form is expressly required by the law or administrative regulation. For example, the Regulation on the Implementation of the Law of the People Republic of China on Chinese-Foreign Equity Joint Ventures requires Sino-Foreign Joint Ventures Contracts (SFJV contacts) to be made in writing. it indicates that the offeror will be bound by the expression of intent if the offeree accepts the offer. According to the PRC Contract Law, mailed price lists, public notices of auction and tender, prospectuses and commercial advertisements, etc. are typically deemed as invitations for offer, rather than offers. Such invitations for offer are not legal binding. However, if the contents of a commercial advertisement meet the above-mentioned requirements for an offer, it shall be regarded as an offer. the offeree has good reasons to believe the offer is irrevocable and has made preparation for performing the contact. Acceptance means an expression of intent to accept the offer. An acceptance should reach the offeror within the time period prescribed in the offer. In the absence of such time limit in the offer, the acceptance should reach the offeror within reasonable time period, taking into account all of the circumstances of the underlying transaction. The acceptance should be made in the form of a notice, except where acceptance may be made by an act on the basis of customary business practice or as expressed in the offer. The acceptance comes into effect once it reaches the offeror. A contract is established when the acceptance becomes effective. Consideration is not a necessary condition to form a contract. Under Chinese law, parties may agree that the effectiveness of a contract is subject to a condition or conditions. A contract whose effectiveness is subject to certain conditions shall become effective when such conditions are satisfied. Even if a formal contract is not formed, parties still shall act in good faith such as complying with confidentiality obligation and various expressed or implied obligations generated from a pre-contractual relationship. In China's regime, the rules of choice-of-law are mainly provided in the PRC Contract Law, PRC Choice Law of Foreign-Related Civil Relation (PRC Choice of Law) and PRC General Principles of Civil Law. the legal facts that caused the establishment, change or termination of the contractual relation took place outside of China. If there are mandatory provisions on foreign-related civil relations in the laws of China, these mandatory provisions shall prevail over parties' agreement and directly apply. In the event that the law has no provision on the application of any laws concerning foreign-related civil relations and parties have no agreement, the laws that have the closest relation with this foreign-related civil relation shall apply. If any disputes arise between the parties over the understanding of any clause of the contract, the true meaning thereof shall be determined according to the words and sentences used in the contract, the relevant provisions in the contract, the purpose of the contract, the transaction practices and the principle of good faith. In the event that a contract is concluded in two or more languages and it is agreed that all versions are equally authentic, the words and sentences in each version are construed to have the same meaning. In the case of any discrepancy in the words or sentences used in the different language versions, they shall be interpreted in light of the purpose of the contract. The PRC Contact Law also provides that where, after the contract becomes effective, there is no agreement in the contract between the parties on certain contents such as quality, price or remuneration, or place of performance, or such agreement is ambiguous, the parties may agree upon supplementary terms through consultation. If a supplementary agreement cannot be reached, such terms are determined in accordance with the relevant provisions of the contract or the transaction practices. if the responsibility for the expenses of performance is not clear, the party fulfilling the obligations shall bear the expenses. there is a clear and specific legal ground or grounds in support of the claim. Plaintiffs are allowed to file a case with a nominal disputing amount. There is no minimum amount requirement for a claim to be submitted to the court. In terms of jurisdiction, for contract disputes parties can agree in writing to be subject to the jurisdiction of the Chinese court at the place having connection with the dispute, such as where the defendant has domicile, where the contract is performed, where the contract is signed, where the plaintiff is domiciled or where the subject matter is located. In recent years, special courts have been set up to handle specific category of disputes. For example, intellectual property courts are set up in Beijing, Shanghai and Guangzhou to handle exclusively intellectual property disputes. In Shanghai, a financial court was founded in early 2018. It has jurisdiction over financial loan contracts, financing lease contracts and contracts for commissioned wealth management. Apart from court litigation, other common forms of dispute resolution in China include arbitration, and alternative dispute resolution (ADR) methods such as negotiation, mediation and conciliation, or a combination of these methods. Some dispute resolution clauses provide that any dispute shall first be resolved through friendly consultation, failing which it shall be submitted to litigation or arbitration. Chinese law and Chinese courts respect arbitration agreements or agreements on ADR. It is clearly provided by law that the court shall not accept the case or interfere into the dispute if parties have entered into a valid arbitration agreement. Over the past decades, commercial arbitration has gradually gained wide populism and recognition in China. Also, as the Chinese government has been engaged in prompting and establishing a 'harmonious society' in China, ADR methods, including mediation, are expected to be booming in the future. the defendant fails to perform its obligation or its performance fails to satisfy the terms of the contract. With regard to liabilities resulting from breach of contract, Chinese law applies the principle of liability without fault. That is, the defendant's intention or negligence is not an element for breach of contract claim. The general rule of evidence is that the party raising a claim bears the burden of proof. Therefore, the plaintiff bears the burden of proving that the above elements are well established. The extent of the plaintiffs' burden varies. Usually the plaintiff can justify its claims merely by a 'preponderance of the evidence' – namely, by showing that the claim against the defendant is more likely true than not. According to Article 108 of the Interpretation of the Supreme People's Court on the Application of the Civil Procedure Law, with regard to the evidence provided by the party concerned with the burden of proof, where the court believes that the existence of a fact to be proved is highly probable upon examination and in combination with the relevant facts, it shall affirm the existence of the said fact. Chinese courts permit the introduction of various kinds of evidence, including documentary evidence, real evidence, witnesses statement, statements by parties, expert's opinion, audio-visual materials and electronic evidence. As a general rule, all types of evidence must be verified by the court as to its authenticity before being allowed to be used as a basis for determining facts. In addition, in order for a piece of evidence to be admitted, the party submitting the evidence needs to prove that the evidence is relevant to the claim and obtained through lawful means. Documents formed outside China need to be notarised and legalised in order to be admitted as evidence. Unlike common law jurisdictions, there is no evidence discovery in China. Except for limited circumstances, a party is allowed to only submit evidence in its favour, as there is no obligation to disclose all documents. The court is allowed to collect evidence, on its own initiative or per a party's request, from the parties to the case or other relevant parties. These parties being investigated by the court have obligation to cooperate and provide evidence as required. the mandatory provisions of the laws and administrative regulations are violated. A contract that is determined as void by the court has no legal effect from the beginning. As such, plaintiffs are not able to rely on a void contract to make a breach of contract claim. The limitation period is another ground commonly relied upon by the parties to defeat the claim for enforcing contractual obligations. In general, the statute of limitation in China for contract dispute is three years starting from the date when the plaintiff knows or should have known the existence of its claim. The limitation period can be interrupted or suspended. Under PRC Contract Law, there is no equivalent regime of impossibility or impracticality. Nonetheless, under Chinese law, a party can refuse to enforce the contract under unforeseeable circumstance. According to Article 26 of Interpretation of the Supreme Court on Certain Issues Concerning the Application of the PRC Contract Law (II), where a party to a contract petitions the court to modify or terminate the contract on the grounds that the continuous performance of the same is obviously unfair to the party or the purpose of the contract will not be realised owing to the occurrence of any material change of circumstances that is unforeseeable, not caused by force majeure, and not a commercial risk after the conclusion of the contract, the court shall decide whether the contract shall be modified or terminated according to the principle of fairness on a case-by-case basis. Moreover, a party who is unable to perform a contract owing to force majeure is exempted from liability in part or in whole in light of the impact of the event of force majeure, except otherwise provided by law. In addition to breach of contract claims, claims based on tortious acts such as fraud claim, claim on misrepresentation or claims based on other party's improper acts (collectively, 'improper acts') are available for commercial contracts governed by Chinese law. performs other acts that violate the principle of good faith. Chinese law does not have an equivalent concept of 'promissory estoppel'. But it is established that a party is bound by its promise to the other party. If the opposing party suffered losses owing to reliance of the promise, the Chinese court may support the injured party's claim relying on the principle of good faith. the damages are caused by the improper acts of the other party. It is important to know that, under Chinese law, the injured party is not allowed to bring a breach of contract claim and tort claim against the opposing party at the same time. The injured party must choose either contractual claim or tort claim. Otherwise, the court will refuse to accept the injured party's claim. Having said that, assuming the inured party fails in its contract claim, it is allowed to initiate tort claim afterwards and vice versa. The claim of tortious interference of a contract is merely a theory to date and is still developing in the Chinese regime. There is no statute supporting such type of claim. Under PRC law, if a party fails to perform its obligations under a contract, or its performance fails to satisfy the terms of the contract, the injured party is entitled to ask the party who breached the contract to bear liabilities for breach of contract such as to continue to perform its obligations, to take remedial measures or to compensate for losses. The injured party may also claim termination if relevant conditions are satisfied. the obligee does not require performance within a reasonable time. In practice, when deciding whether specific performance shall be granted, the Chinese court will consider whether the enforcement of the order requesting specific performance is possible and feasible. If it is impossible or difficult to enforce, the court will be reluctant to order specific performance, and will be inclined to order alternative remedies such as compensation of losses. The trend is that Chinese courts are increasingly willing to order specific performance comparing with themselves in the past. In addition to specific performance, monetary damages are also available under Chinese law. The amount of damages the innocent party is entitled to is generally equal to the damage it actually suffered, including both direct loss and indirect loss such as loss of profit, but shall not exceed the amount that has been foreseen or ought to be foreseen when the party in breach concludes the contract. Punitive damages are only available for certain types of claims in customer protection cases. For commercial cases, punitive damages are not available. Chinese Law does not have any statute dealing with indemnification. In practice, courts generally recognise the validity and enforceability of indemnification clause agreed by parties. causation between breach of contract and damages. where the amount of liquidated damages agreed upon are significantly higher than the damages incurred. Parties may also agree upon limitation on damages in contractual or extra-contractual claims. However, if such agreement on limitation is about personal injury to the other party, or property damage to the other party as result of deliberate intent or gross negligence, such agreement is void under the law. The innocent party may also seek remedies by claiming termination of contract if relevant conditions agreed by parties or provided by law are satisfied. The parties may agree upon conditions under which either party may rescind the contract. the other party delays performance of its obligations, or breaches the contract in some other manner, rendering it impossible to achieve the purpose of the contract. Contract law in China has been well developed in the past 20 years. It offers good protection to commercial parties, including foreign parties doing business in China or having commercial relation with Chinese parties. Chinese contract law respects that a contract is a mutual agreement between parties. A binding contract could be formed by the process of offer and acceptance or other alternative ways and becomes effective once it is formed, with limited exceptions. Chinese contract law recognises the good faith principle and principle of fairness. For foreign-related contract, parties are allowed to select foreign law as a governing law. Where parties have a dispute over the meaning of a contract clause, it could be determined according to the context used in the contract, the relevant provisions in the contract, the purpose of the contract, the transaction practices and the principle of good faith. In the event of a breach of contract, the injured party may request specific performance, claim damages it suffered or terminate the contract if conditions are satisfied. Before 2016, China did not enter into any international convention or bilateral treaties regarding cross-border enforcement of court judgments with other major economics such as the United States and EU nations. Also, Chinese court did not apply the principle of reciprocity in practice. Accordingly, it is difficult or even impossible to enforce Chinese judgments in major foreign jurisdictions and vice versa. Bearing this situation in mind, companies having transactions with Chinese parties are inclined to submit disputes to arbitration. However, this situation has changed. First, a Chinese court enforced a judgment issued by the Singapore High Court in late 2016 and a judgment issued by a US court in 2017 based on the principle of reciprocity, respectively. Also, the Chinese government signed the Hague Convention on Choice-of-Court Agreements in September 2017, joining a framework with all EU nations (except Denmark), Singapore, Mexico, the United Kingdom and the United States to prompt cross-border enforcement of court judgments. We expect China's National Congress will approve the Convention in or around 2019 to make it effective in China. 1 Peng Shen is a special counsel at Baker McKenzie. 2 See Articles 5 and 6 of PRC Contract Law. 3 See Nanjing Shui Mu Qiang Hua Decoration Limited v. Rong Chang Construction Materials Business Department of Ru Bing City, Jiangsu Nantong Intermediate Court, 2018, PKU Law. 4 See Article 14 of Regulation on the Implementation of the Law of the People's Republic of China on Chinese-Foreign Equity Joint Ventures and Article 11 of Detailed Rules for the Implementation of the Law of the People's Republic of China on Chinese-Foreign Contractual Joint Ventures. 5 See Si Fupai International Shares Limited v. Yongfeng Si Fupai Packaging Holding, SPC, 2017, PKU Law. 6 See Shenzhen Jianda Construction Engineering Limited v. Jin Yilin (Dongguan) Housing Development, the Guangdong Dongguan Intermediate Court, 2018, PKU Law. 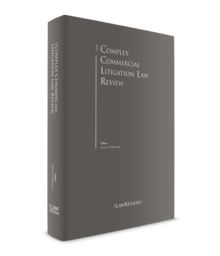 7 See Provisions on Several Issues regarding the Establishment of International Commercial Courts issued by the SPC. 8 See Article 52 of PRC Contract Law. 9 See Article 53 of PRC Contract Law.